In this South Terrace tapestry, we see the work of artist Fabrice de Villeneuve. The works of de Villeneuve are works of art in that they capture the feeling of time and place in a poignant and elegant way. He was born in Lille in France, and his works include scenes from nature, daily life and even special events held in France. Here we see a lovely scene by a home terrace of a table setting. His inspiration comes from both his background in France and its romantic style of artistry, as well as his love of capturing moments of everyday life. 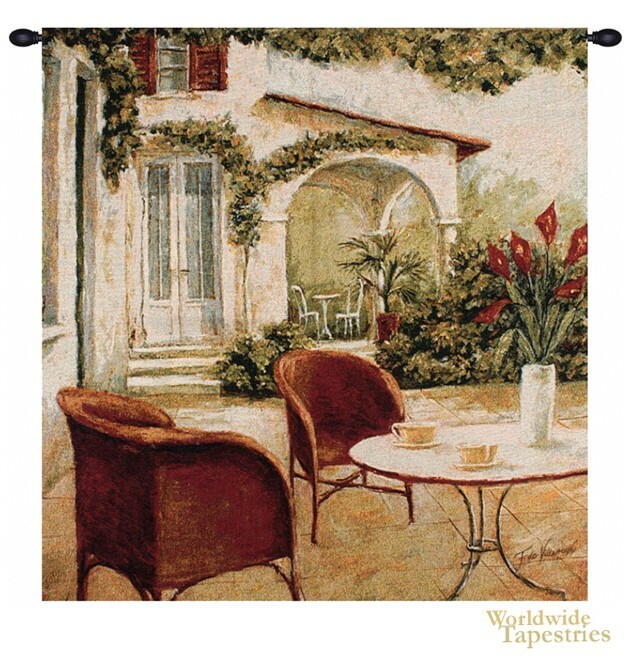 This tapestry "South Terrace" is lined and has a tunnel for easy hanging. Note: tapestry rod and tassels, where pictured, are purchased separately.